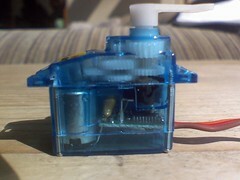 Servo motors allow to position somthing, for example a pointer. See the Arduino API for information about “writing” a position. That position is regulated with help of a feedback loop. Let’s look a bit deeper into the feedback mechanics of a servo motor. Removing the DC motor, gives some mechanical parts as well as a potentionmeter to get feedback. By adding feedback of the position of the motor, the position can be better controlled. This is basic feedback theory, but requires reading an extra signal. 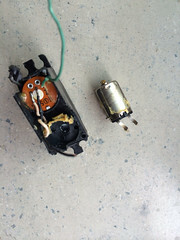 This is often not done with a servo motor. It is also possible to buy continous rotation servo motors directly, e.g. from Adafruit. The advantage of using such kind of motors is the gearbox.